On 15 March 2017 elections were held for the second chamber in the Netherlands. Many watched in fear that there would be move towards “the wrong populism” as the prime minister called it. This outcome was avoided. There was less attention to the development with respect to Basic Income. Supporters tended to be disappointed by the fact that none of the parties that were strongly in favour of the policy wouldget a representative in the chamber in the coming years. Several parties in favour of Basic Income were in the race to be elected and secure a representative in the chamber, but all were ultimately unsuccessful, including Vrijzinnige Partij (VP, Liberal Party), De Burger Beweging (DBB, The Citizens Movement), Piraten (Pirate Party), Lokale partij (LidK, Local Parties together), BIP/PvdK/V&R (Basic Income Party, Party for the interest of Children and the Party for Freedom and Right, respectively, who operated in a joint venture), and the Greens (not to be confused with Green Left). To the right: The Liberals (VVD, 33), Christian Democrats (CDA, 19), the populist Parties (Wilders, 20), Forum for Democrats (2), 50+ Party (4). In total 81 seats. Given these figures, he proposes to cooperate with the PvdD, GL, and D66 in an effort to keep the Basic Income on the political agenda. In the meantime, there have been several developments in the Netherlands since the beginning of 2017. 1. In January, Terneuzen – a community of around 54,770 inhabitants in the Province Zeeland – reached the news headlines because of an initiative of a City Council Member for an experiment to remove conditions on public assistance. The experiment would involve the removal of some rules and regulations for a group of recipients of it in a Terneuzen neighbourhood. This initiative was quickly swept from the table by the government, however, based on the stipulations in the Participation Law (see: http://daskapital.nl/2017/01/ministerie_schiet_plan_basisin.html). 3. In February, the Bureau for Economic Policy Analysis (CPB) published its report about the internalization of costs of the election programmes. Amongst them, the election programme of the VP (a new and very small liberal party) contains a proposal for a Basic Income in the amount of € 800 per month. The report presents Basic Income as a very high expense, which would result in insufficient funding for social security and high tax increases. The VP replied in detail in its publication “Comments on CPB report”. Unfortunately, the VP did not get enough votes to be represented in the chamber. 4. In an effort to design a better scheme for realising an UBI, a “mini symposium” was organized for 10 March 2017. The decision was made to work towards a colloquium on the feasibility of a UBI with experts from different political backgrounds and representatives of the press. The paper “Basic Income feasible and affordable” was produced as a result of the symposium. 5. As a new campaign item, Vbi has made stickers to put on coins to gain more public awareness of Basic Income. How can I be part of basic income? 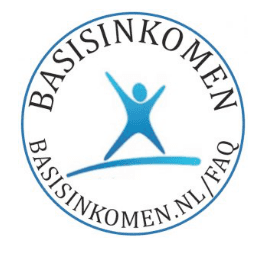 If you’re commenting on this article looking to join Vereniging Basisinkomen, information is available here: http://basisinkomen.nl/participatie/.